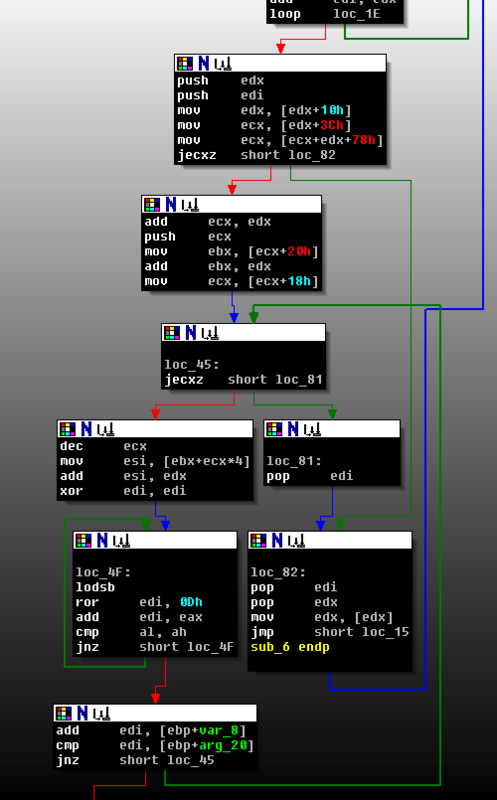 HKEY_LOCAL_MACHINE\SOFTWARE\Microsoft\Windows NT\CurrentVersion\Image File Execution Optionにプログラム名のレジストリキーを作成する. 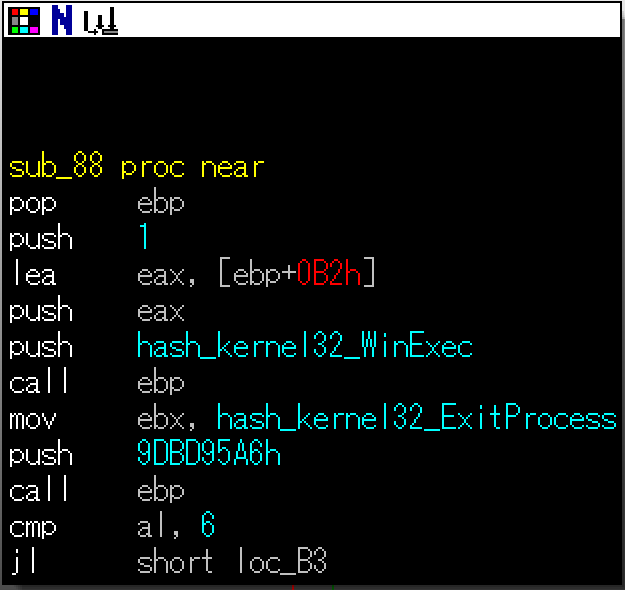 C:\Windows\System32>sc config BITS binPath= "C:\Windows\system32\svchost.exe -k TempGrp"
C:\Windows\System32>sc config BITS binPath= "C:\Windows\System32\svchost2.exe -k netsvcs"
IDAPython, IDA SDK: Welcome で調べることができる. 後はひたすら調べる. 個人的に解析を行う際に未定義の関数 (sub_***) がそのままでは他の命令と混じってしまい, 判別がしにくいため, 色をつけてみる. 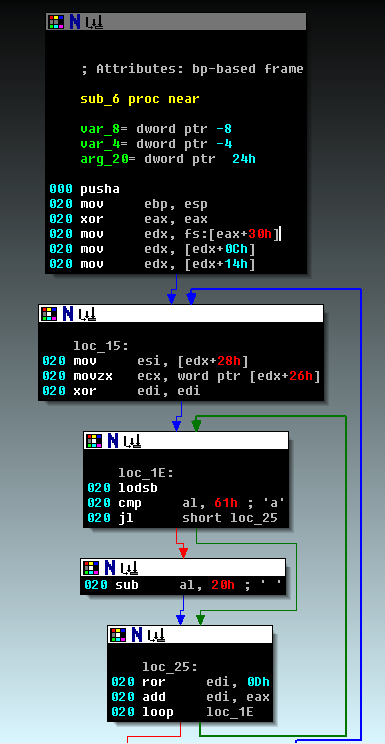 StartDebugger(path, args, sdir) : デバッガを実行する. add_bpt(ea, size, type) : ブレークポイントを設定する. -e <opt> The name of the encoder module to use. -i <opt> the number of encoding iterations. 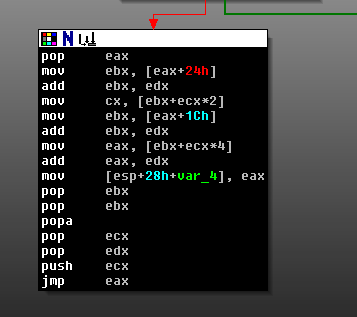 -o <opt> A comma separated list of options in VAR=VAL format. -p <opt> The Platform for output. -s <opt> NOP sled length. 仮にN番目の時に関数のハッシュと一致したとする. そのN番目の値をAddressOfNameOrdinalsの配列の要素として取り出し, それを序数 (ordinal) としてAddressOfFunctions (EAT) の配列の要素とする. そうして取り出した値が目的関数のRVAとなる. 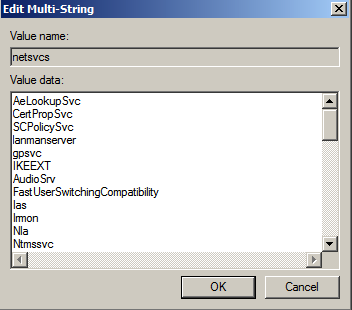 eaxはスタックからIMAGE_EXPORT_DIRECTORYを戻しているため, [eax+24h]はAddressOfNameOrdinalsであり[ebx+ecx*2]は序数(ordinals)である. ここでecxはecx番目に目的関数を一致した値であり, 上記のNに当たる. また[eax+1Ch]はAddressOfFunctionsであり, [ebx+ecx*4]は目的関数のRVAである. なおコメントアウトは/* ~ */ or // で記述する. 文字列 "EICAR-STANDARD-ANTIVIRUS-TEST-FILE" かつ16進数として　0x58 0x35 0x4f 0x21　を含む, もしくは　0x58 0x35 0x4f 0x21 0x50 0x25　or　0x58 0x35 0x11 0x11 0x50 0x25　のファイルを検知する.